The mainstream media blindly championed  the Iranian deal at the expense of reason, celebrating its “signing” and every prospective step for implementation. But the not-so-surprising revelation is that there is, in fact, no Iran deal. There are just a number of political commitments made by each of the so-called P5+1 countries, in the hope that Iran will somehow reform itself. Iran, on the other hand, seems barely, if at all, committed to the non-agreement. Rather, it is poised to receive international sanctions relief while continuing on its belligerent course. The Obama administration acknowledged in November that neither America, nor the Iranians, nor the other P5+1 members have actually signed the accord ostensibly designed to stall Iran’s quest for nuclear weapons. Yet a review of Fox News , The New York Times , and other media organizations shows that the mainstream media remain uniformly committed to misleading the public. These reporters must know by now that the deal has not been signed—meaning that there is no deal—yet they continue to pretend that it is. 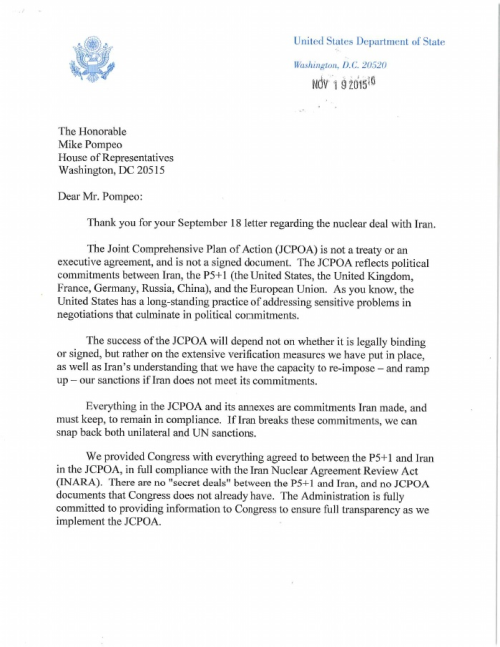 “The Joint Comprehensive Plan of Action (JCPOA) is not a treaty or an executive agreement, and is not a signed document,” Julia Frifield, the State Department Assistant Secretary for Legislative Affairs, wrote in a November 19 letter to Republican Representative Mike Pompeo (R-KS). The reality is that the international community is now poised to grant Iran a sweetheart sanctions deal while the regime continues to flout both the spirit and the letter of that meaningless accord. This is the IAEA investigation that required Iran to provide the IAEA with samples from the Parchin nuclear site. It had also previously threatened to harm  the IAEA’s head, Yukiya Amano. Despite recent letters  sent respectively by 35 Republican senators and 21 Democratic senators expressing concern about Iran’s ballistic missile activity, the Obama administration and its allies are still lining up to provide Iran with rapid sanctions relief, perhaps in January. Secretary of State Kerry recently sent a letter to Congress  saying that “Iran had not engaged in any covert or other activities that could significantly advance its nuclear weapons program,” according to The Washington Times. Iran’s parliament, such that it is, approved a deal , but it was not even the same deal that the P5+1 holds out as the agreed upon deal. As Iran gets close to receiving a huge cash reward for its lack of cooperation, deceit, and continued belligerence, the mainstream media still refuse to call this deal what it is: a sham agreement founded on nothing but what Iran says it will be. If Iran finds this farcical political agreement’s terms nonbinding, why shouldn’t America do likewise? President Obama is perpetrating a dangerous hoax through his triumphal advocacy for this so-called deal, and the media, for the most part, are participating.